I t’s a proven psychological fact that people will do more to avoid pain than they will to get a gain. So, for example, let’s say you sell soap. You could tell people that your soap will make them clean and smell nice. But more people will actually buy your soap if you tell them that your soap will help prevent them dying young from a horrible disease. Both are true, but the second one is going to compel more people to buy soap. Now, at this point, you might be thinking that talking about the pain all the time is a) pretty pessimistic and b) kind of sleazy salesman-y. And it could be those things. But it doesn’t have to be. 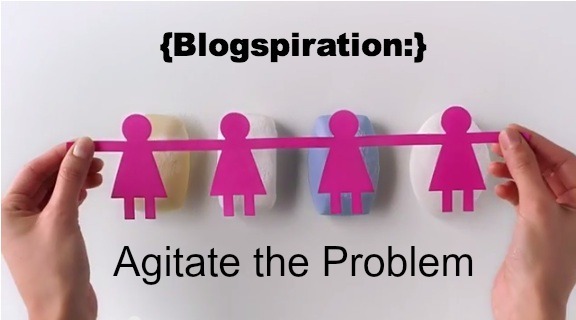 Write a blog post in which you agitate your customer’s problem—without iritating your customer. 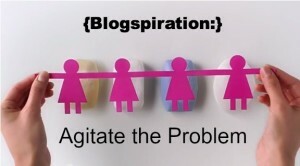 There are two ways you could go about this blogspiration topic. You could go all out and imagine the absolute worst case scenario for your customer, spinning their problems all the way out until they’re facing a life or death decision instead of just buying soap (as in our example above). Back when I was in high school English, and we were analyzing literature for metaphors and that sort of thing, I used to call this kind of writing, “beating people over the head with the symbolism stick.” As in, GEEZ, we get it already!! Advertising used to be all about that kind of thing. But today’s consumer is a bit more savvy and, let’s face it, jaded. So the second way to approach it is with a little more finesse and subtlety. Let’s take our soap example again. In this commercial, Dove does a great job of agitating a problem that might only be at the very edges of their market’s consciousness. They show how most soaps strip skin of… well, we’re not really sure. Whatever’s on that pink paper. But Dove soap doesn’t. Is this a life or death situation? Nope. But Dove has taken a problem and agitated it a little. And in so doing, they make their product look like the natural solution. And that’s exactly what you want to do in a blog post like this. It’s also a great example of show, don’t tell. Knowledge without action is pretty pointless, so take a second and think of a problem that your ideal reader has that you could agitate a little in a blog post and present yourself as the natural solution, then let us know what that problem is in the comments below. I just wrote a blog post on what i wish every entrepreneur will learn to do and how it is costing them a business that makes the kind of impact and money they want to make. In the post, i outlined whats going on with them at the moment and how all of that could change if they discover and practice customer research.